Showing results for tags '2500'. So brought my truck to dealer to get skid plates put on. Asked them to remove the front air dam and they said the 2018's are no longer able to be removed. Anyone have pics of theirs removed or know how to remove it? 2012 GMC Sierra 2500HD BCM reprogram to resolve "Hyperflash"
Hello everyone. I purchased a complete set of LED bulbs to replace all the stock bulbs for my 2012 GMC Sierra 2500 HD. In addition, I upgraded the tail lights and the head light assemblies as well to house these new bulbs. I'm very happy with the complete change-over except for the hyper flash issue I'm having with the new LED turn signals. Originally, I thought I could just replace the original flasher for an LED flasher that doesn't monitor the load on the circuit and therefore operates normally with the light-loaded LED upgrade. Turns out that the 2012 doesn't have a flasher and it's the BCM that controls the turn signal lights. From what I've researched, it appears that the BCM can be programmed to allow the use of LED's by changing the configuration of the BCM to a "cab/chassis" setup where the vehicle would accept the LED tail lights. I'm guessing that with changing everything including front turn signal bulbs to LED, the BCM reprogram to "cab/chassis" will not fix my issue because I've changed the front turn signals to LED as well. The other option I've researched is installing load resistors for every LED bulb. That seems a bit outrageous and hacking into the original wiring harness is not what I'd prefer as it makes it more susceptible to malfunction, corrosion, etc. not to mention the heat these resistors tend to give off, if installed improperly, can begin causing a whole other bundle of issues. So my question is, will the BCM reprogram resolve the hyper flash issue? Depending where you are but most dealers will charge $120 - $200 for the 3 minutes it takes to plug in but if it fixes the issue, I'd rather go that route instead of hacking my wiring harness. Thanks in advance for any help! Do oem accordian style mirrors fold? Okay so my truck game with accordion style mirrors from the factory. The button on my door shows left for extend, right for retract which works however it says center for fold which does not work. I we have been told by a couple people recently that the mirrors did not fold and extend however they said that it could be reflashed to fold instead of extend. This makes no sense to me. So do the factory mirrors fold and extend? Ok so I have a 99 sierra 2500 4x4 6.0. Parked it last night no problems. Get in this morning back out and put in drive . As I pushed the gas and started straightening the steering wheel the front driver side made a loud pop sound. After that accelerating I had a vibration for a while. Stop and take off no pop but vibration. I drove for about 45 mins vibration went away. I put in 4wd low no issues 4wd hi no issues. Any clues? I have a stock 2016 GMC Sierra 2500 base crew cab. Currently running 18", would like to upgrade to 20s. I'm looking at 20x9s, do I need an offset? What size AT tires can I run on these that will not rub? Note: I'm hauling a trailer at least a few times a month, so I'm not looking for a lift or a level. 2004 Silverado 2500 bed replacement with later model? Hello Everyone, I just purchased a Chevy Silverado 2500. It would be a longbed if it had a bed on it.... I have seen plenty of beds for sale that were left when someone installed a flatbed or service body. I did not expect it to be any trouble finding a decent replacement. I was wrong....... I have been online & on the phone all day. I am finding lots of Ford and Dodge beds and a few 2008-2014 Chevy beds. I am begining to wonder if I can reasonably fit a 2008+ bed on my 2004 truck? Is anyone here familiar enough with the mounting of the beds to tell me what would be involved with putting the 2008-2014 bed on my 2004 truck? Thanks. S.
Might have a ridiculous question but I cant see the issue in theory so I am consulting the experts. I have a 2015 2500 HD 6.0 4x4. I recently had long tubes installed. First finding long tubes for this application is insane. I could not specifically find anything that guaranteed fitment for this year. I ended up with speed engineering stainless that was made for the 6.0 up to 2013 according to them it should carry over in later years which is true given the L96 has changed little to none. I had zero fitment issue with the passenger side but the left was awful...... hit the motor mount, frame, and drive shaft. I had the shop modify the header to fit......being honest he did exactly that and I'm impressed but I believe the header is leaking like nobody's buisness due to the 8 different cuts and bends he made. and makes an awful sound I do not feel like going through hell and back or spend the money on another long tube header for that side to run into the same issue...... so what if I ran a shorty 1 7/8 stainless on the driver side and a 1 7/8 long tube on the passenger side? It's off the wall but why not? If the true duals x and I have a custom tune in theory it should not be an issue right? How do you use your truck? I just thought I would post a poll to see how everyone uses their truck. I'm sorry if the questions are vague or not quite clear. Thanks. TPMS reset on HD or thick mud tires? Hi guys, new here! I have done a lot of research trying find a TPMS reset tool that will actually work with the thicker mud tires. I bought one from Amazon, the JDiag model, which works fine on a friends 15' Silverado, but I can't get it to work on my 14' Sierra. The only thing I think is keeping it from working is the fact I have the BFG AT KO2's which are a much beefier tire. Has anyone had any luck resetting their sensors with this type of tire, or any other heavy duty tires like on the 2500/3500's? If you did, which reset tool did you use. I see a lot of people saying they can't reset their sensors, but now I wonder if the thicker tires is what's keeping us from doing so? Hey what's up everyone. Not sure if this is where to ask this or not. I'm looking to upgrade from a chevy 2002 1500 z71 to a 2500 chevy or gmc I've been looking from about 2004 and up. The biggest issue I'm trying to decide right now is gas or diesel. I am a mechanic but never worked or messed with diesels.So I tow a open car trailer and racecar in the summer during race season right now about 6,000-7,000lbs depending on which car is on it. I do tow some other stuff here and there too. But I would like the ability to tow more and to have something better for long distance trips and driving/ towing in the mountains. Now mountain trips would probably be less then a handful of times a year. Unless we really decided we liked racing at the track out there then might go a few more times. I don't plan for the truck to be a daily driver. I've put about 20,000 on my 1500 I have now in the 8 years I've had it. About 2-3 years of that was daily driving. Now whatever I do get I plan on having for a good while probably at least 10+ years I would say. And also want to be prepared if I ever upgrade to an enclosed trailer or ever got a camper etc.. What I do know right now is 6.0 is a gas hog, Duramax will give you better fuel economy and obviously better when it comes to towing. I know Lbz trucks seem to be the ones everyone says are the best to go for. But I don't know if I do enough hauling to justify the added expenses and maintenance for a Duramax. Also just trying to figure out what the best years, engine, and trans combos are to look for and any other issues either of these trucks have to be aware of. Sorry if this was too big of a post or not the right place to put this but Any advice help or opinions are greatly appreciated. Picked up a new GMC 2017 Duramax 2500HD that came leveled with 2.5-inch shock extensions, new torsion keys and 20x9 Fuel wheels w/ 305 Nitto Ridge Grapplers. With this setup do I need to be concerned with CV angles? Would adding UCA’s and new shocks improve things? If so, what option would you suggest? Cognito, CST, Fabtech… Bilstein, Fox... This truck will spend most of it's time on the road with only short offlroad runs to and from the trail head. I’d consider a proper 4-6” lift cranked down with 35’s but I’m worried about fitting into my parking structure. Also, I already have the 305’s and don’t want the wheel well gap or to worry about selling the 305’s. Currently the truck sits at about 80 inches; the same height as my buddy’s raptor that fits the parking structure with not much room to spare. How tall are you guys running a 4-6” lift on 35’s? Anybody running 4-6” on 33’s? Anybody have any feedback on the 3-6" S.T.L. High Clearance lift kit from CST? Also, for the cost of the 3-6” lift w/ a decent shock option, why not go with the coilover conversion from BDS? Thanks in advance for any assistance. Zane Merva Executive Editor, GM-Trucks.com 3/13/2017 Just in time for a huge March Nor'Easter, we're getting our first opportunity to drive the heavily updated 2017 Silverado HD on our home turf. For the next few days, we're parking this Silverado in the GM-Trucks.com Garage. Since this 2500HD is also packing the "increased strength" 6.6L Duramax Diesel Engine with 910 lb-ft of torque, we're already lining up things to tow and haul around. From now until Friday we're going to share our week with you as temporary owners of the most powerful consumer HD truck on the market today. 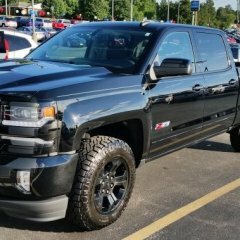 Our example HD is equipped as follows 2017 Silverado 2500 HD LT Double Cab 4WD Staring Price- $43,796 Notable options 6.6L Duramax Diesel - $9,340 18" Chrome Aluminum Wheels - $1,295 Trailering Equipment Package - $575 LT Convenience Package - $1,425 Trailering Mirrors - $310 Five Camera Trailer System 5th wheel prep - $370 (I think this falls under "Provisions Special Equipment") Total Suggested Price: $62,575 Be a part of this review! What do you want to know? What do you want us to take a photo of? What would you like covered if we give a video walkaround? Stay tuned for more updates to this thread later today and as the week goes on! I’m New to the forum, and I have been looking for a day or two but can’t find anything on the topic of if control arms from a 2001-2007 2500 will fit on a 2000, and if not what the best recommendation would be? CASH TALKS! TEXT ME OR CALL 406-690-537I TO DISCUSS, TEXT PREFERRED AS I WORK OUT OF CELL SERVICE OFTEN. Selling my beloved 2007 GMC Duramax Diesel, last year of the best of the LBZ model code. No emissions from the factory to deal with, and considered to be the best model of duramax ever made. This is a very clean truck, I looked long and hard to find this, and it is my 3rd lbz GM truck. No leaks no drips no check engine lights nothing. Ready for anything and will last forever, I see these trucks on the forums over a half million miles getting beat on daily and running forever, this has been babied. Yes I am asking over book and considering offers, please realize this truck has had a lot more than the average truck has had put into it. Really like buying a brand new truck with everything completely done. Truck is awesome all around. The front seats are showing light wear but no rips, rears and rest of interior looks like new. A couple light paint chips on the front bumper, and I have all factory touch up paints. That's it for imperfections. THIS TRUCK IS CLEAN CLEAN CLEAN. I hate selling, however this truck is such a garage queen it makes it hard for me to justify keeping. I started a new position shortly after purchasing the truck and have a work vehicle I use the marjority of the time. The truck is only used for weekend soccer interstate trips etc. I am the 3rd owner, first was in california and second was in billings and was an oil worker, and it was a garage queen its life. I purchased the truck and did extensive upgrades and reliability modifications to make it the perfect truck in my eyes. I have spent thousands in upgrades and countless hours and extensive labor charges to get the truck to where it is today. This will make someone a reliable powerful vehicle for many years to come with everything done. Always ran premium diesel and Stanadyne with every fillup. Truck is fully loaded slt model, every available option except leaking sunroof. Bose stereo, power heated leather etc etc. I will do my best to list everything I can think of about the truck. I am sure I will miss much as so much has been done it is hard to even remember it all. Everything was done with reliability in mind first, and performance second. I have most of the stock parts as well that have been removed. Upgrades and performance modifications... Allison deep transmission pan and new gasket with all new filters. Transgo jr shift kit. Fleece all on module Duramax store transmission cooler line kit upgrade (replaces notorious oem leaking lines) Professionally installed rough country 3" lift kit, including new steering stabilizer, 4 new shocks, new rear block, new upper control arms with better angle for ball joint lift, new torsion keys. Also did new pitman and idler arm at this time and full alignment. 16" XD wheels with 33" Cooper AT3 tires, maybe 5k miles on tires. SDP PCV reroute kit AFE Series 2 intake with afe pre filter 4" MBRP mufflered exhaust with black tip. 3" MBRP downpipe MBRP uppipe Sinister EGR delete kit Edge Insight Gauge Monitor with egt into passenger side exhaust header. Gauge is mounted in dash pod and professionally wired. Airdog 165 lift pump Capped resonator Fleece headlight modification (allows fogs brights lows driving to all be on simultaneously) Full window tint with vent visors. 2 sets of weathertech floor mats, one still new in box. Trailer brake Snugtop Topper color matched and fitted for the truck, matches the lines perfect. 5th wheel rails in bed GMC Gatorback heavy duty mudflaps Lund chrome nerf bars Blacked out led taillights EFI LIVE by Idaho rob at atp in Idaho, comes with efi live tuner. If you are not familiar with efi live tuning take some time to read up on google, it is amazing what it does for these trucks and Idaho Rob is considered among the best tuners in the business. Truck was tuned after all modifications were completed and comes with 5 tunes that are able to be shifted on the fly with the dsp 5 switch mounted in the cigarette lighter spot and is tuned for the transmission with shift kit. Tunes range from optimized stock, tow tune with turbo tow brake, 90hp eco, 120 street, and 150 hot race, and are changeable simply by turning the switch from positions 1 through 5. I have used the tow tune and the eco tune primarily, as I get older I enjoy cruising more than speeding. The truck does have the ability to really pull however in the higher tunes. Very clean tuning with almost no smoke except in tune 5 where it will smoke a little when getting after it. Truck has not been rodded, adult owned and driven always. Maintenance items completed... All completed within the last 6 months. Repeat drain and fills of both differentials with 500k mile synthetic delo dif fluid. Repeat drain and fill of transmission and allison filters using only transynd fluid. (Internal filter also change with the deep pan addition.) New oem gm radiator hoses and coolant filled drained and filled multiple times. Hyperlube racing coolant additive added on last fillup. New oem thermostats Brake fluid flushed twice, filled with Valvoline synthetic brake fluid. Power steering flushed twice, filled with blue line synthetic power steering fluid. Midas full alignment after lift kit installation. 4 wheel tire balance. Full midas inspection showing everything in the good green category. New intermediate dorman problem solver steering shaft and bearing kit (fixes notorious oem clunking steering problem) New spicer lifetime greasable ujoints All zerks repeatedly greased with lucas red and tacky Recharged air conditioning. Turbo Vane cleaning done. Synthetic oils and oem filters, oem airdog liftpump filters. Truck is ready to go. Title in hand, lien through local bank which my wife works at and all title work can be done at bank on day of sale. I may consider delivery for a fee, depending on how far etc. I may consider a partial trade on a cheaper vehicle (under 5kish) with your cash offer. Would need to know all vehicle details. SERIOUS INQUIRIES ONLY PLEASE!!! I am working huge hours right now and don't have time for tire kickers. Vin available upon request. Truck is located in billings montana and can be viewed at almost any time. I will try to get more pictures up of the truck as time allows. First picture is current with topper, other pic just to show how it looks without topper.